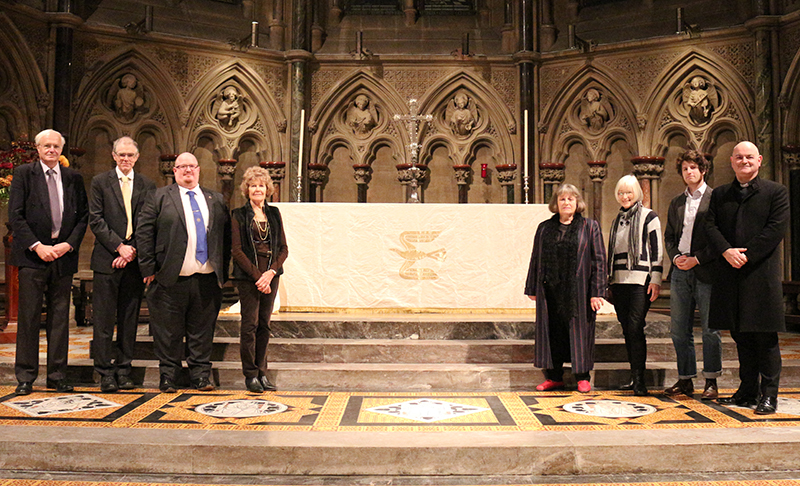 St John’s Chapel has a new altar frontal to mark religious celebrations after a competition was launched to design a new motif. Michael Reiners, a third year History of Art student at St John’s, received a £250 prize from Sir Christopher Dobson, Master of St John’s College, after his design of a Dove of Peace was chosen as the winner of the student competition. The altar frontal covers the High Altar in the Chapel and is used to mark the Christian seasons of Christmas, Easter, and the Feast of St John the Evangelist who the College was named after. It is also used for weddings of members of the College. It is made of white damask and the gold design of a dove was embroidered by Sue Young, the Chairman of the Cambridge Embroidery Guild. The new altar frontal is part of the preparations under way to mark the 150 years since the College Chapel was consecrated, the celebrations will take place in May 2019.